Carrie Cakeaway: Hello, first customer! And sock it to him I did! 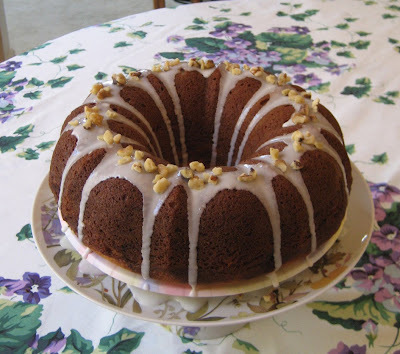 A moist yellow cake with a thick ribbon of cinnamon brown sugar swirled through the center, a light drizzle of vanilla icing, and a sprinkle of toasty chopped walnuts, the Sock-It-to-Me is a perfect companion to a hot cup of coffee. What a way to ease into a lazy weekend morning or kick start a busy day at work. Let's see this from a bird's-eye view, shall we? Cheers to a delicious start.